“A skilled project manager consistently applies universal processes and skills to bring consistency and results to one project after another.” This is the introductory remark by Larry Richman for the second edition of his book titled Improving your Project Management Skills. Richman has rightly mentioned that learning project management skills can help improve strategies for clarifying project objectives, avoid serious errors of omission, and eliminate costly mistakes. Richman is a certified project management professional and has more than 30 years of experience teaching and practising project management. 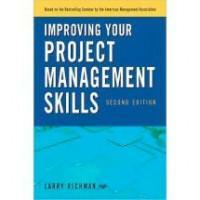 As is his name, this book is also very rich in many facets of project management. This book is divided into five main parts: project management foundation, initiating, planning, executing, monitoring and controlling and closing. Though this book is based on an American management seminar, it has been updated for consistency with the Guide to the Project Management Body Of Knowledge (PMBoK) fourth edition. Starting with project management vocabulary and progressing to step-by-step processes and methodology on project management, this book helps readers understand and systematically apply project management skills through the entire project cycle. While there are numerous illustrations presented, from an evolution of project management to a project closeout checklist, it also has some very good examples to consolidate key themes and provides working models of high level documents (pages 42-46). Moreover, scheduling activities, resources and budgets, project plans, executing projects, leading project teams, managing risk and closing a project are written very well. Since this book is revised based on PMBoK fourth edition, it will also help those who would like to take the PMP (Project Management Professional) exam. As well as a glossary, it also has an appendix with a list of recommended reading, project management organisations and websites for those who would like to get more information and excel on project management knowledge. In conclusion, this is a must-read book for students, project management practitioners and project managers where everyone is likely to receive information and valuable advice on project management. Prabesh Aryal is the associate director at FHI360 in Nepal and the representative for the Project Management Association Nepal (PMAN) at a regional and international level. He can be contacted at prabesh.aryal10@gmail.com. Prabesh Aryal has written 3 articles for us.